Following a review and planning session, the Pirates are pleased to announce a change to the structure of the club’s women’s programme. The change sees the existing women’s team split out into distinct flag and contact football teams under the leadership of separate Head Coaches. The move is designed to ensure both strands of women’s football within the club receive the focus and expertise they need to grow and succeed. Current women’s team Head Coach and offensive coordinator Alan Young will continue to bring his wealth of flag football knowledge to the Pirates as he moves to take on the role of women’s flag head coach. 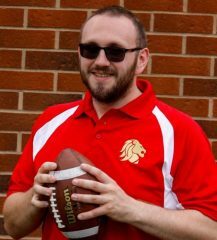 Alan, who is also head coach of the Men’s GB Flag team and QB for the Glasgow Hornets, brings over 16 years of experience as a player and coach to the role. Women’s team Defensive Coordinator Andrew McGowan steps up to take on his first head coaching role as women’s contact team head coach. 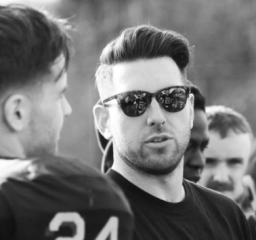 As well as coaching with the Pirates women’s team, Andrew has been defensive coordinator at the Glasgow University Tigers for the last four seasons, is a veteran linebacker with the Pirates senior team and represented GB as part of the national programme squad in Milan in 2013. The club intends to enter both Opal flag and Sapphire contact women’s competitions later in 2017 and women’s football at the Pirates will now be taking a break until practice returns for flag football on Wed 2 August at Crownpoint Sports Complex in Glasgow with a taster session. A small squad will also be representing the club in the Big Bowl flag competition in Germany in May. If you’re interested in getting involved with either flag or contact football, contact info@piratesfootball.co.uk Women’s flag football is available from 16+ and contact football from 17+.